HTC’s new mobile VR headset which is rumored to be named as ‘Link’ will use the ximmerse neon tracking system. This will be entirely different from the technology that the Vive series was using. Ximmerse is one of the popular neon tracking system developers and has teamed up with HTC in developing the new headset. HTC’s VIve series headset uses outside-in SteamVR Tracking system which is known as ‘Lighthouse’. The upcoming Vive standalone Daydream headset will be using Google’s inside-out WorldSense Tracking. The new system uses the light optical tracking markers present on the headset and on controllers. These can be seen as the blue orbs these orbs are detected by a small external camera. This makes the tracking system quite similar to the PlayStation VR. The main advantage of this technology is that it gives the same performance at lower cost. According to Ximmerse, the have used the camera which creates an eight by eight-foot tracking space. The use of the inside-out tracking system is an added advantage. 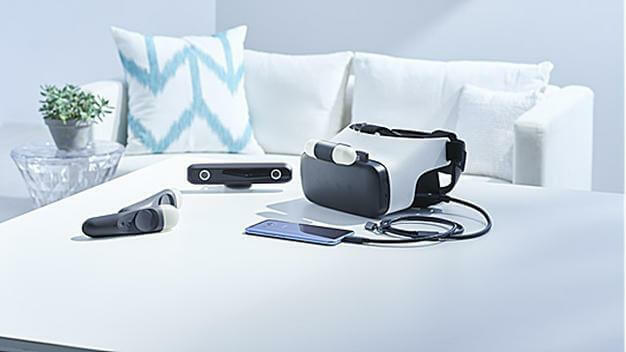 The devices like Daydream and Gear VR offer rotational tracking. These devices work best for the gesture based input rather than the true motion input. On the other hand, Neon tracking uses positional tracking for both headset and the controllers. They are far more compelling to VR input because they can be tracked through 3D space. This will open the way for the far more complex application of VR. According to the company, the neon controllers can last for 40 hours with two AAA batteries. The stereo camera which is the main component has 960p resolution and operates at 90Hz. According to Ximmerse, the camera can provide accuracy of 10mm (positional accuracy), the precision of 2mm with a 16ms latency. The components of this tracking system are connected via a 2.4GHz wireless that provides the necessary information to the phone for tracking and the input data that has to be processed.